So when Geithner rolls out more details of his plan later this week  this time on the tricky question of getting toxic assets off the banks' books  it will be a dangerous moment for him. Not only will the health of the banks and the economy depend on whether his new program is well received but Geithner's reputation will be on the line as well. Panned after he put out a vague framework on Feb. 10, the new Treasury Secretary has only so many chances to instill confidence. With the new bank plan, he's getting a second chance, but it will be a hard sell. If the perception is proving hard to tackle, the reality is even harder: so far few private investors have shown any interest in tapping the trillion-dollar subsidy to buy toxic assets from the banks. Hedge funds and other players all want to know the terms of the sale before they even think about stepping up to the plate. So far, Geithner and Treasury have provided little detail. "The question of how to price the asset is still on the table, unresolved," says Scott Talbott, a top lobbyist for the Financial Services Roundtable, an industry association. Among other key questions: What percentage of the purchase price will the government fund? A senior Administration official said as much as 80% of the purchase price could be government money, but the number has not yet been fixed. And who gets to keep the profit, if there is any? Does Uncle Sam let the private player keep it all, or does the government get some? How and when does the private player have to repay the government loan? And what if the toxic asset stays worthless  does the private buyer lose his money first, or does the government? It's not even clear how Geithner would run such a complicated sale. Previously he talked about using an auction or a reverse auction (in which sellers bid prices lower to attract buyers). Now Administration officials say they may just expand a new program run by the Federal Reserve. That program, the Term Asset-Backed Securities Loan Facility (TALF), is designed to spur consumer lending by stimulating sales of securitized consumer loans. The New York Federal Reserve has had to extend the application period because of market qualms, though Talbott says interest is building. If Geithner provides answers to these questions in his rollout later this week, he may start to turn the corner on public skepticism toward him, the bank plan and the government's recovery efforts. He might even spark a stock-market rally. But the banking industry's hopes are more modest: "As long as he comes out with details on the public-private investment fund, then it's not a miss," says Talbott. If he doesn't, he'll have an even bigger mess on his hands. Alabama Senator Richard Shelby  the ranking Republican on the Senate Banking Committee  Senator John McCain and others have called for the government to stop messing around and just let the bad banks fail. 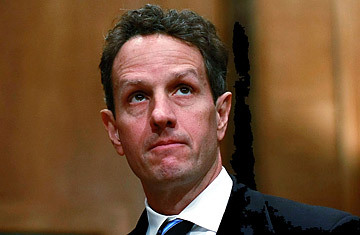 If Geithner doesn't deliver, they'll surely deliver the same verdict on him. See who's in Obama's White House. See 25 people to blame for the financial collapse.